Gently tapered rims reduce spills during transfer or pouring. The handles remain cool on the stove. The glass covers lock in moisture, vitamins, and flavor. The lid design is so well seated that a vacuum can form with the pan (remedied by application of a little heat under the pan). The set includes one and two quart saucepans with lids, an eight and a ten inch skillet, and a six quart Dutch oven with lid. The pans are oven safe to 550 degrees. The set is safe for use in the dishwasher or oven, under the broiler or on the stovetop. They can also be placed in the freezer to store your food. Low to medium heat gets the best performance from these pans. 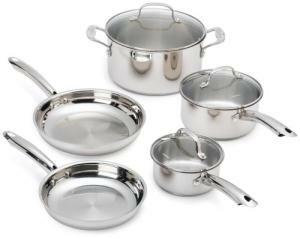 With this set you get the combined benefits of the metals, plus the convenience of dishwasher safe cookware. This set would suit a small household or would nicely prepare any number of smaller food items.